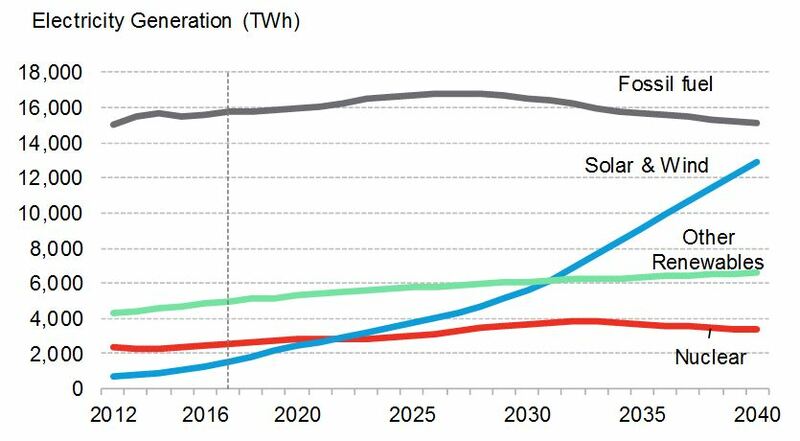 This year’s forecast from BNEF sees solar energy costs dropping a further 66% by 2040, and onshore wind by 47%, with renewables undercutting the majority of existing fossil power stations by 2030. Renewable energy sources such as solar and wind are set to take almost three quarters of the $10.2 trillion the world will invest in new power generating technology over the years to 2040, according to a major independent forecast published today. New Energy Outlook 2017, the latest long-term forecast from Bloomberg New Energy Finance, shows earlier progress than its equivalent a year ago towards decarbonization of the world’s power system – with global emissions projected to peak in 2026 and to be 4% lower in 2040 than they were in 2016. “This year’s report suggests that the greening of the world’s electricity system is unstoppable, thanks to rapidly falling costs for solar and wind power, and a growing role for batteries, including those in electric vehicles, in balancing supply and demand,” said Seb Henbest, lead author of NEO 2017 at BNEF. NEO 2017 is the result of eight months of analysis and modelling by a 65-strong team at Bloomberg New Energy Finance. It is based purely on the announced project pipelines in each country, plus forecast economics of electricity generation and power system dynamics. It assumes that current subsidies expire and that energy policies around the world remain on their current bearing. • Solar and wind dominate the future of electricity. We expect $7.4 trillion to be invested in new renewable energy plants by 2040 – which is 72% of the $10.2 trillion that is projected to be spent on new power generation worldwide. Solar takes $2.8 trillion and sees a 14-fold jump in capacity. Wind draws $3.3 trillion and sees a fourfold increase in capacity. As a result, wind and solar will make up 48% of the world’s installed capacity and 34% of electricity generation by 2040, compared with just 12% and 5% now. • Onshore wind costs fall fast, and offshore falls faster. Offshore wind levelized costs will slide a whopping 71% by 2040, helped by development experience, competition and reduced risk, and economies of scale resulting from larger projects and bigger turbines. The cost of onshore wind will fall 47% in the same period, on top of the 30% drop of the past eight years, thanks to cheaper, more efficient turbines and streamlined operating and maintenance procedures. • China and India are a $4 trillion opportunity for the energy sector. China and India account for 28% and 11% of all investment in power generation by 2040. Asia Pacific sees almost as much investment in generation as the rest of the world combined. Of this, just under a third goes to wind and solar each, 18% to nuclear and 10% to coal and gas. • Batteries and new sources of flexibility bolster reach of renewables. We expect the lithium-ion battery market for energy storage to be worth at least $239 billion between now and 2040. Utility-scale batteries increasingly compete with natural gas to provide system flexibility at times of peak demand. Small-scale batteries installed by households and businesses alongside PV systems will account for 57% of storage worldwide by 2040. We anticipate renewable energy reaching 74% penetration in Germany by 2040, 38% in the U.S., 55% in China and 49% in India. • Electric vehicles bolster electricity use and help balance the grid. In Europe and the U.S., EVs account for 13% and 12% respectively of electricity generation by 2040. Charging EVs flexibly, when renewables are generating and wholesale prices are low, will help the system adapt to intermittent solar and wind. The growth of EVs pushes the cost of lithium-ion batteries down 73% by 2030. • Homeowners’ love of solar grows. By 2040, rooftop PV will account for as much as 24% of electricity in Australia, 20% in Brazil, 15% in Germany, 12% in Japan, and 5% in the U.S. and India. This, combined with the growth of utility-scale renewables, reduces the need for existing large-scale coal and gas plants, the owners of which will face continued pressure on revenue despite some demand growth from EVs. • Coal-fired power collapses in Europe and the U.S., continues to grow in China, but peaks globally by 2026. Sluggish demand, cheap renewables and coal-to-gas fuel switching will slash coal use by 87% in Europe by 2040. In the U.S., coal use in power drops 45% as old plants are not replaced and others start burning cheaper gas. Coal generation in China grows by a fifth over the next decade but reaches a peak in 2026. Globally, we expect 369GW of planned new coal plants to be cancelled, a third of which are in India, and for global demand for thermal coal in power to decline by 15% over 2016-40. • Gas is a transition fuel, but not in the way most people think. Gas-fired power sees $804 billion in new investment and 16% more capacity by 2040. Gas plants will increasingly act as one of the flexible technologies needed to help meet peaks and provide system stability in an age of rising renewable generation, rather than as a replacement for ‘baseload’ coal. In the Americas, however, where gas is plentiful and cheap, it plays a more central role, especially in the near term. • Global power sector emissions peak in just over ten years, then decline. CO2 emissions from power generation increase by a tenth before peaking in hit a high in 2026. Emissions then fall faster than we previously estimated, lining-up with China’s peak coal generation. We expect India’s emissions will be 44% lower than in our NEO 2016 analysis as it embraces solar and invests $405 billion to construct 660GW of new PV. Globally, emissions will have dropped to 4% below 2016 levels by 2040, not nearly enough to keep the global average temperature from rising more than 2 degrees Celsius. A further $5.3 trillion investment in 3.9TW of zero-carbon capacity would be consistent with keeping the planet on a 2-degrees-C trajectory. In the U.S., the Trump administration has voiced support for the coal sector. However, NEO 2017 indicates that the economic realities over the next two decades will not favor U.S. coal-fired power, which is forecast to see a 51% reduction in generation by 2040. In its place, gas-fired electricity will rise 22%, and renewables 169%. One of the big questions for the future of electricity systems is how large amounts of variable wind and solar generation can be accommodated, and yet keep the lights on at all times. Skeptics worry about ultra-cheap renewables depressing power prices and squeezing out base-load coal, gas and nuclear plants. Note: Levelized cost of electricity covers all lifetime expenses of generation from a new plant. These costs include site development, permitting, equipment and civil works, finance, operations and maintenance and feedstock (if any). An executive summary of NEO 2017 and related materials can be downloaded from the micro-site on this link.